The ABFRealmMapView class inherits from MKMapView. It manages real-time data fetching and displaying annotations for a Realm object subclass that contains coordinate data. In addition, the map view clusters annotations based on zoom level by default. 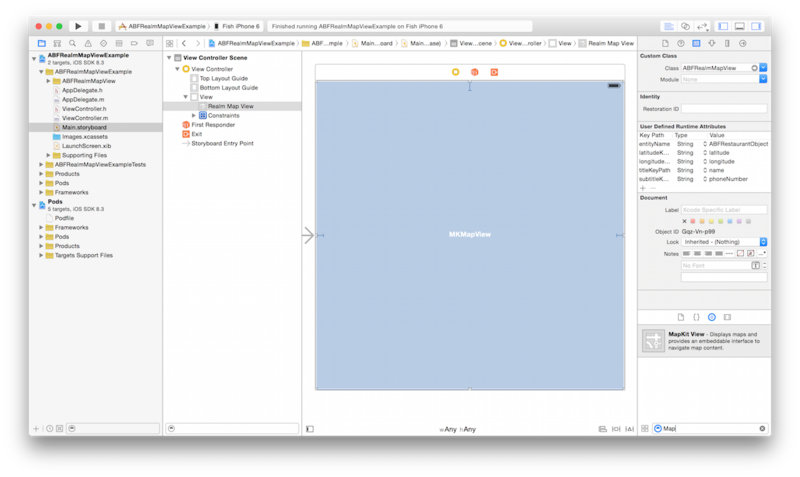 This allows for the creation of a map with little to no code, via Interface Builder! You can see the code for ABFRealmMapView on GitHub.. This tutorial uses ABFRealmMapView v1.2. Location data plays a big role in building great mobile app experiences. Maps are immersive and users are increasingly demanding highly-responsive experiences. ABFRealmMapView simplifies creating a dynamic map in your app by utilizing the fast query speed of Realm. You can now implement real-time fetching on map changes and automatic annotation clustering in just a few minutes! Just store your location data in Realm and then let ABFRealmMapView know the class of objects you want it to display, and the names of their latitude and longitude attributes. In the tutorial below we will go over how to install ABFRealmMapView, use some sample data, and get this all displayed in your app. Let’s get started! In main.storyboard, add an MKMapView to the view controller, and change its “Class” (in the Identity Inspector, at the top right) to ABFRealmMapView. and run pod install again. Adjust the ABFRealmMapView properties to specify the Realm object name and key paths for latitude, longitude, and annotation view title and subtitle. You can change these properties in Interface Builder, as shown in the image below. Add an IBOutlet for the ABFRealmMapView from your storyboard to this view controller. That’s it! 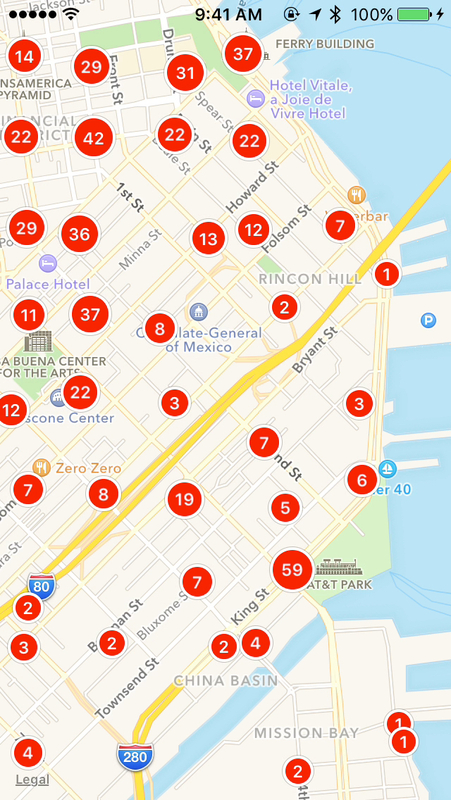 Run your app and enjoy the restaurants of San Francisco.